After a delightful lunch we headed into the wilderness In search of the "big 5", the lion, rhino, leopard, elephant and buffalo. We were lucky to see lots of impala, which our guide said is "McDonalds" for most of the animals. They must be very tasty. They are also very graceful and lovely. We also saw a group of Zebras, one of which had been attacked by another animal, probably a lion, according to the guide. The zebra had lots of bloody scars but he seemed to be Ok. There are no zebra doctors in the jungle so it is the survival of the fittest. 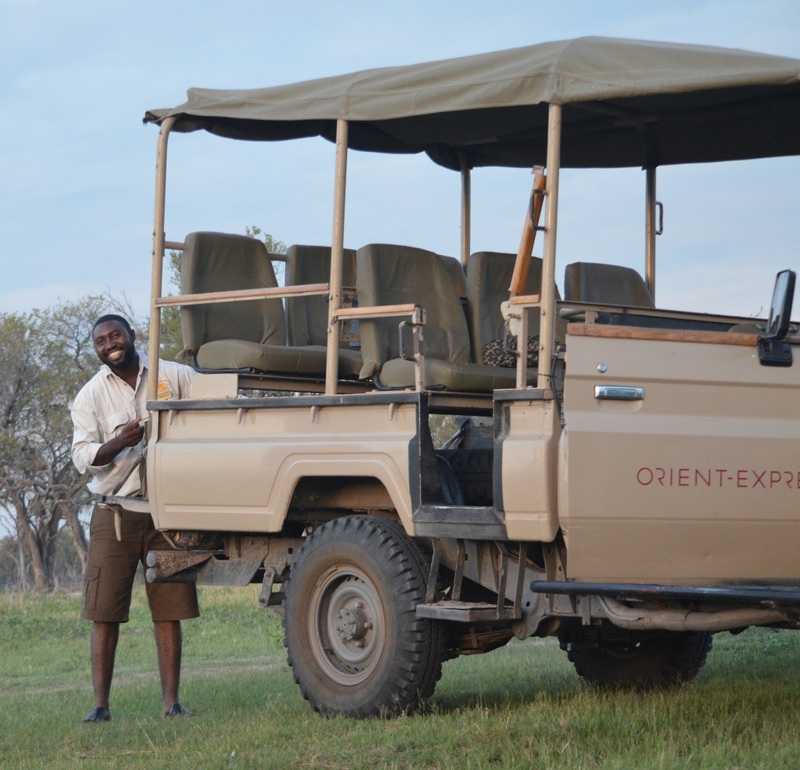 To round off the first game drive we saw a beautiful giraffe and two huge elephants. We are confident we will see a lion, lepoard and cheetah tomorrow. It is up at 5:30 and back to the jungle......the mighty jungle. 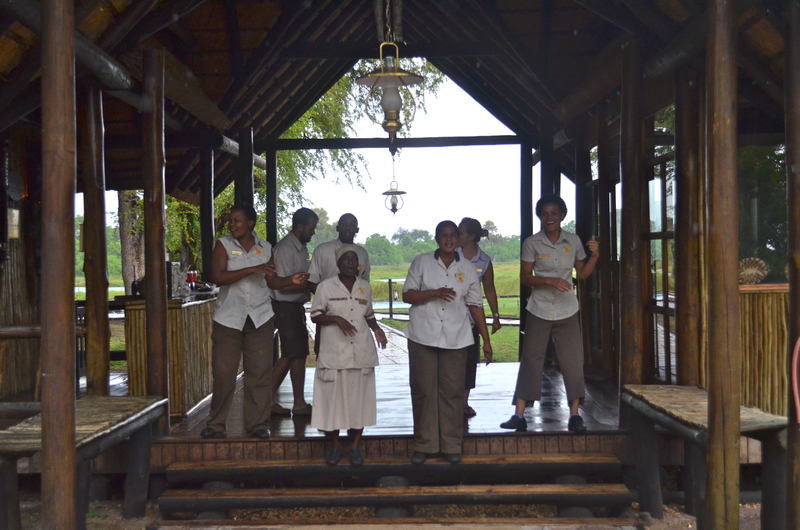 We stopped at a lovely watering hole with lots of different species of birds and ducks as well as hippos. I counted at least 25 hippos who put on a show for us. They spouted water like a whale, stuck their heads out and opened their mighty mouths. I do not want to get caught by one. As big as I am they could probably chop me up in two bites. According to Nesco they are herbivoreds and also the most dangerous animals on land because when they decide to charge the never back down. The staff is very friendly and attentive. Our wish is their command. 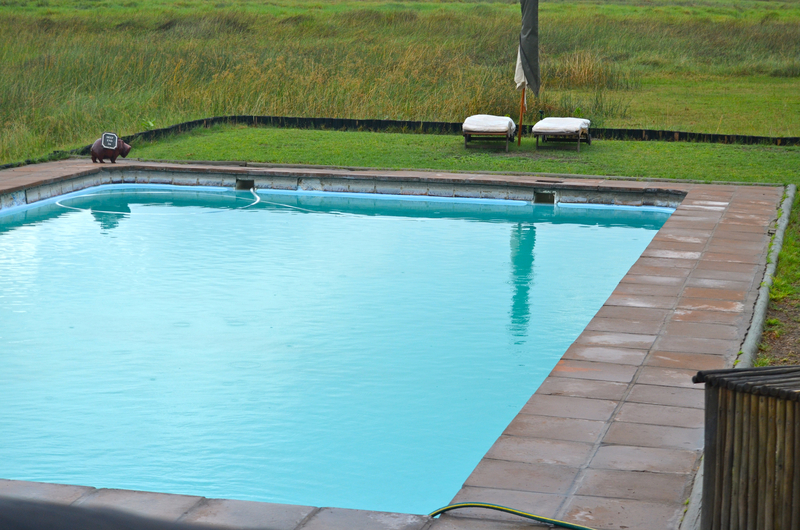 We have the best room in the camp, the top suite, a huge deck overlooking the Khawi river where hippos come to play...and play they do. The room is lovely. We have our own little swimming pool, which we have not had time to use and an open air deck with two showers and a huge tub. We both enjoyed the outside showers. I kept expecting some animal to peep over the rail. Even alone it was a romantic moment. As I finish this we are serenaded by a cacophony of sounds of the jungle. It is off to bed for the 5:30 wake up call. We need the sleep as we have not adjusted to the time difference. Day 3 There was a huge rain last night and it was still raining hard when they brought tea and muffins at 5:30 so we decided to forgo the early drive and catch up on some needed sleep as our bodies have not adjusted to the time difference and long flight. By 10:00 the rain had stopped so after a light breakfast we were off again. After the rain the weather was very cool and it is a very pleasant day. I had expected it to be very hot here this time of the year which is the ending of their summer but so far it has been great. 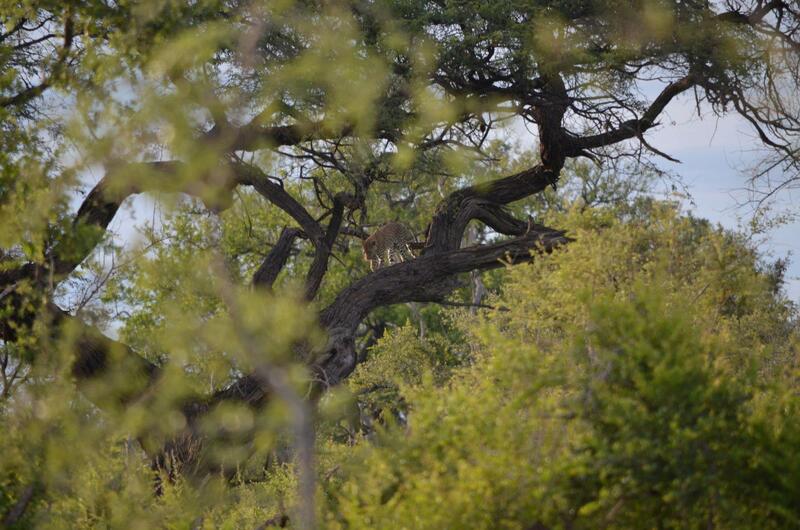 The first couple of hours were very disappointing, just huge numbers of Impalas and one elephant. 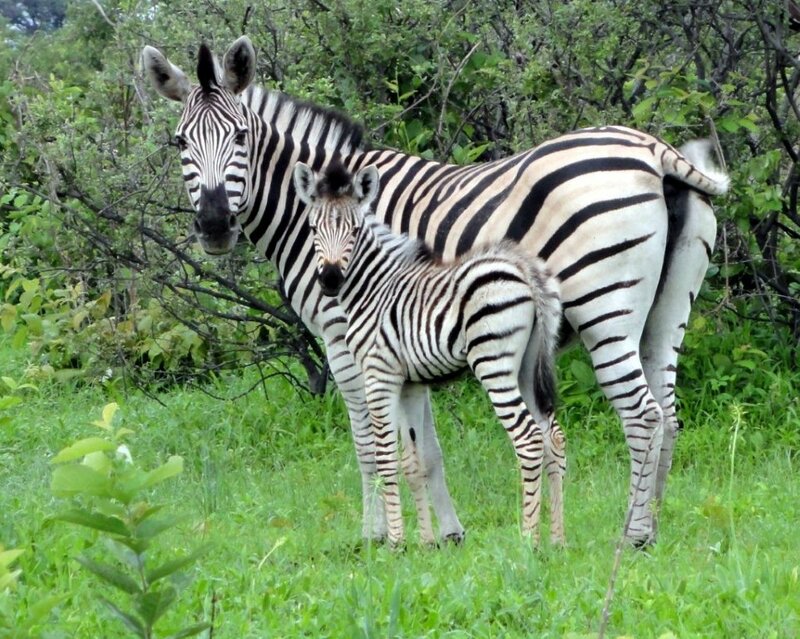 Finally we came across a dazzle, the word for a group of zebras and wow, did things pick up after that. We came across a huge herd of elephants on the move. Nesco thinks there were at least 200, the majority of which were female. There was a significant number of young ones, some of which were probably only a few days old. Nesco stopped the jeep and we sat just barely out of their path as they lumbered by. They paid absolutely no attention to us voyeurs as they crossed, drank from the river and emerged looking two tone. The part of the body that went through the water was a very dark gray. We thought they were all gone but as we were leaving another group emerged from the trees and it included one of the biggest males I have ever seem. They decided to choose another crossing and headed straight for the jeep. I expected Nesco to move but he just sat there as they continued. He says they have very poor eye sight so I guess when they realized there was an obstacle, which was the side of the jeep that I was on, they diverted path and moved in front of us. It was definitely a close encounter and I must admit to being a little nervous. 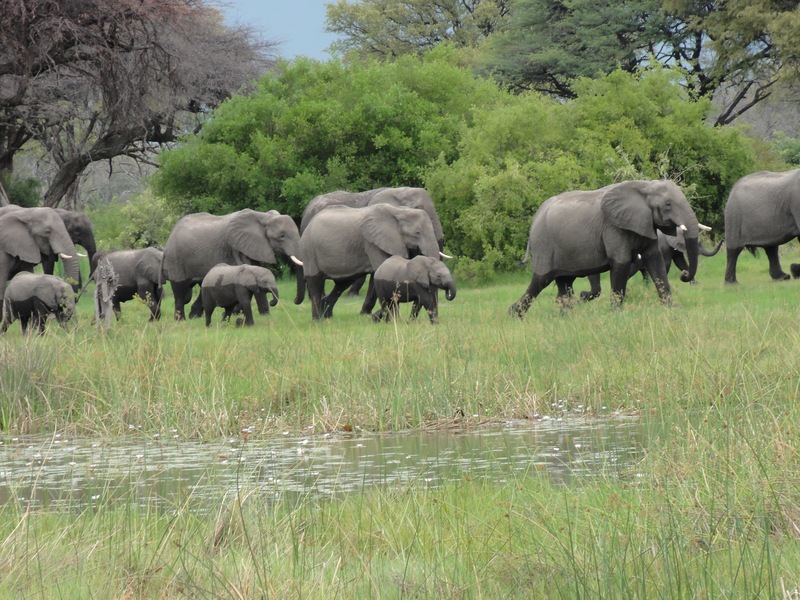 The elephants were on the move looking for new food sources and the minerals from the land that they need to survive. It was a true Kodak moment and Cecilia, the photographer, got some great shots. I never expected to have such a fabulous experience. 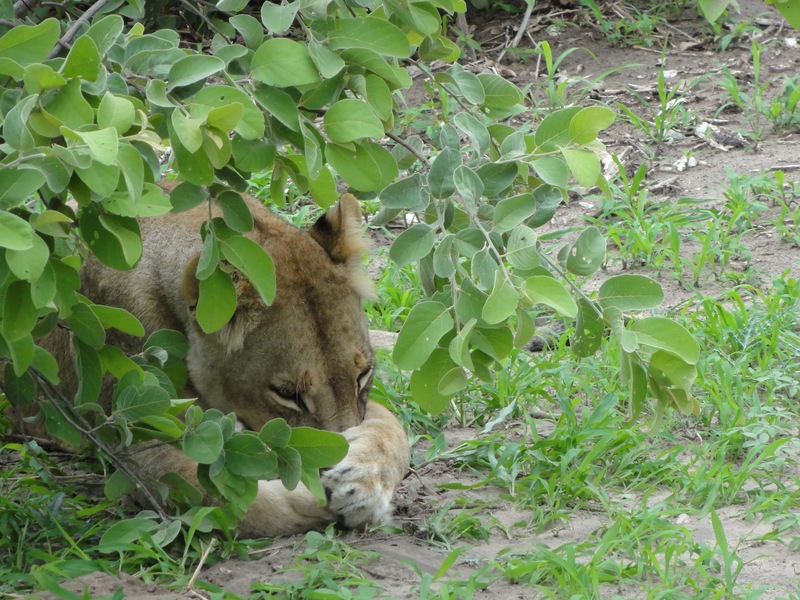 As I was thinking this day cannot get better we ran across a pride of 3 female lions napping. Nesco stopped the jeep within 5 feet of them and they just continued to lay there, occasionally opening an eye and looking at us. It is quite unbelievable to be that close to animals in the wild who pay no attention to you. I kept thinking any minute we are going to be lunch but I guess they do not think that humans are very tasty. 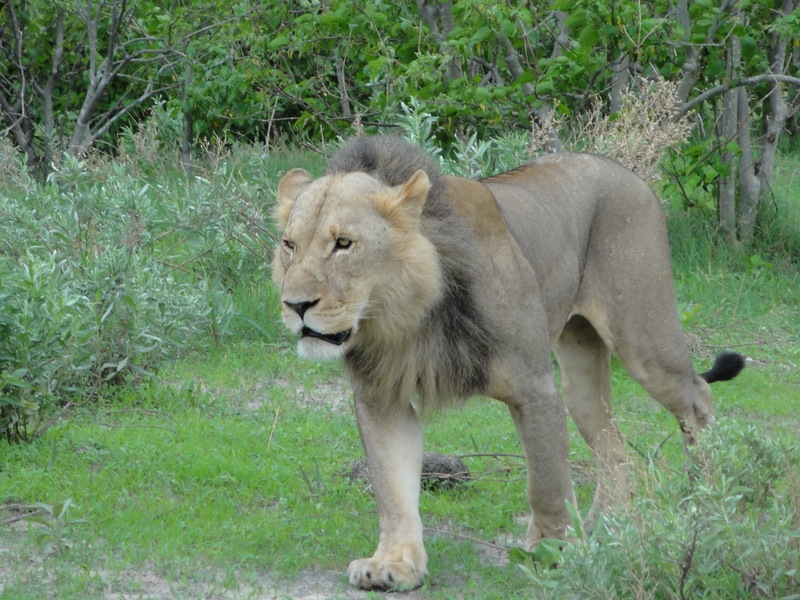 We headed back to camp thankful for such a great day and suddenly walking down the road was one of the males of the pride. As he ambled closer, within reach,I thought this one is definitely going to jump in my lap but he went on his merry way proving that the "king of the jungle" has no time for lowely peons. I still can not figure out why am I alway on the side closest to the wild? We followed him for some time and he never acknowledged our presence. As I finish this I am sitting on the deck of our room watching hippos play in the Khwai River and see a streak of red as the sun sits on this wonderful day and the birds serenade us with lovely music. Dinner will be served on our patio at 7:45. What a perfect ending to a perfect day!! !